Living in a great place is even better when you've got your financial house in order. Like MONEY magazine on Facebook for tips on saving more, investing better and spending wisely. Located on five miles of shoreline, Fairfield is home to two universities (Sacred Heart and Fairfield University), as well as many marinas and parks. Though General Electric's headquarters are here, most residents work an hour away in New York City, making Fairfield's metro station the second-biggest commuter stop on the line. Families love the highly rated school system, but access comes at a cost: The median home price is almost $620,000. --D.M. It's your turn to choose. Which city should be No. 1? Contest: Where's your favorite place to take a weekend drive? Is Fairfield a great town, or what? Due to an error by our data provider, an earlier version listed incorrect stats for this city's number of colleges. For joint returns, taxes are twice the tax on half the couple�s income. Connecticut�s personal exemption incorporates a standard deduction. An additional tax credit is allowed ranging from 75% to 0% based on state adjusted gross income. Exemption amounts are phased out for higher income taxpayers until they are eliminated for households earning over $71,000. What home is complete without a casino and Star Wars-themed bar? Get an entertaining palace in our no. 1 town. Luxe homes, great schools and exclusive communities. In these posh places, it helps to have a big paycheck. The Lime Truck's owner is a driving force behind the O.C. 's growing mobile food scene. Money can't buy you love, but a little window-shopping is ok. Top 25 places to find the wealthy unattached. Get a modest condo in tony Greenwich, CT, no. 29. Or a house with a sundeck in no. 94 Coral Springs, FL. It's still a tough job market, but these 25 counties have experienced the most employment growth recently. At the Newton Community Farm, locals come together to help harvest � and even rebuild its farmstand after a fire. In 2010, CNNMoney visited McKinney, now No. 2 on Money's 2012 Best Places to Live. In 2010, CNNMoney visited Eden Prairie, now No. 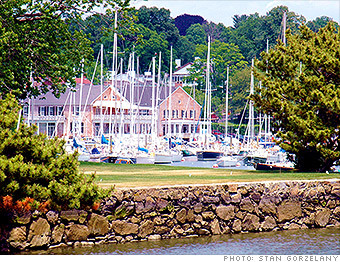 3 on Money's 2012 Best Places to Live.